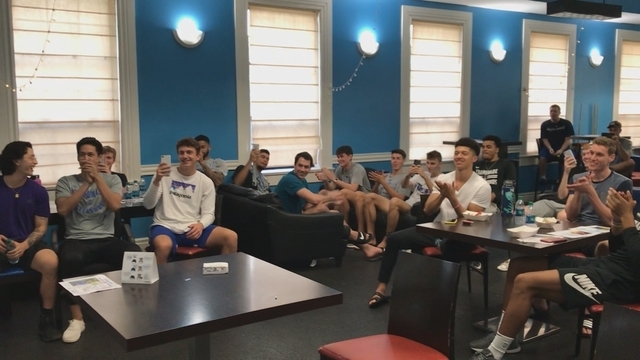 INDIANAPOLIS – For the first time since 2014, the Chaminade University men's basketball team is headed to the NCAA West Regional. The Silverswords (23-7) earned an at-large berth and are the No. 7 seed in the region, held in San Diego, Calif., at Golden Gymnasium, and hosted by No. 1 seed and Pacific West Conference member Point Loma. The 'Swords will face second-seed and Great Northwest Athletic Conference Tournament champion Seattle Pacific this Friday at 2:30 p.m. PST (11:30 a.m. HST). It is the fifth overall appearance by the 'Swords in the regional and the third for head coach Eric Bovaird. Seattle Pacific is 21-6, finishing second in the GNAC regular season and claimed the conference tournament championship by dispatching Western Oregon on Saturday. It will be the first meeting between the teams since December 2016 when Chaminade defeated SPU, 87-86, at McCabe Gym on Kiran Shastri's 3-pointer with less than a second remaining. The winner will meet the survivor of the Saint Martin's-Concordia Irvine winner on Saturday. The regional final will take place on Monday and with it, the West Region's representation into the Division II Elite Eight in Evansville, Ind. Grant Dressler (Las Vegas/Sacramento State/Palo Verde HS) is the Pacific West Conference's second-leading scorer at 19.3 points and leads in 3-pointers per game with 3.0. Tyler Cartaino (Newbury Park, Calif./Newbury Park), who earned PacWest All-Tournament Team honors, averages 17.7 per outing and is the conference's top field goal shooter at 59.2 percent. Erik Scheive is next at 16.5 points. Dressler and Cartaino were All-PacWest First Team selections while Scheive earned second team honors.